This MIPI DPHY/LVDS Combo Tx PHY IP is designed to the MIPI D-PHY 1.2 specifications and LVDS specifications. This IP supports up to 1.5Gbps for both MIPI and LVDS data rate. This IP can be applied to OpenLDI v0.95 also. This IP includes two PLLs. 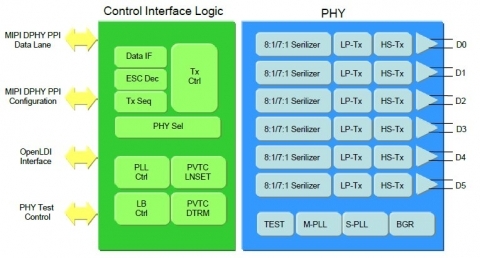 One is a generic PLL for MIPI clock generation, and the other is an X8/X7 multiplier PLL for serial clock generation.